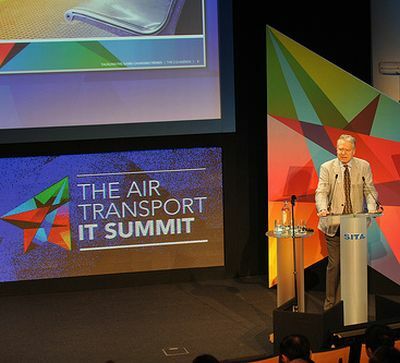 Whilst the airlines of the world congregated in Paris a couple of weeks back to look at the hardware of the air transport business, the IT boffins assembled near Brussels for SITA’s 13th annual assembly. From all around the world 300 experts representing the largest carrier, Delta, right down to Iran Asseman Airlines with its ATRs, Fokker 100s and two remaining Boeing 727s. 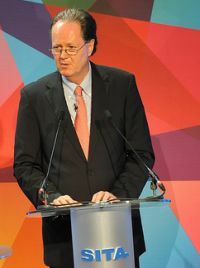 SITA chairman Paul Coby, perhaps better known previously as British Airways Technology (Communications) Director, saved his powerful presentation until the opening of the second day, entitled ‘Tackling the Game-Changing Trends’. Moderator throughout the proceedings was Mark Pilling, Publisher of Flight Global, who was co-sponsor of the whole event. Mr Coby summed up where airline IT was at the present and where he thought it was going. He pointed out how quickly and successfully the airline world, with SITA’s help, had gone from paper tickets to 97% electronic in less than a decade. 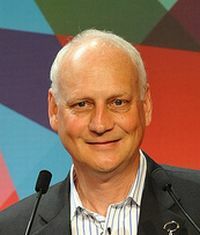 He pointed out that future generations will be much more computer savvy than the present incumbents, highlighted by Star Alliance’s Chief Executive Jaan Albrecht, who used a slide of his own three-year-old grandchild using a tablet computer. Mr Albrecht is after standardisation, cutting down the costs of IT, and gaining more consumer interaction. “We already travel with our own technology: smart phones, tablet devices and laptops. An increasing focus for innovation is how we can link our technology with that of our customers. And these days customer technology is often more advanced than corporate technology, so we find ourselves playing catch-up,” said Mr Coby. Peter Hartman, President and Chief Executive of KLM, concerned the audience with a tale of how KLM monitors customer data and is able to approach cold its own clients airside at airports offering them travel awards. A little too scary for this writer. Vivek Badrinath, CEO of Orange Business Services and Francesco Violante, CEO of SITA, explained in some detail the partnerships ‘Cloud’ future mentioning that SITA’s involvement with pilots' electronic flight bags was another way that the airline owned organisation is very much behind the scenes in the way that actual operations are run. Philip Wolf of PhoCusWright Inc, an American, gave what was undoubtedly the most relaxed session of the whole two days, reminding his audience of what a tremendous 12 months it had been with regard to news from around the world, and how it has affected air travel. He sees mobile users overtaking desktop users over the next five years. Nawal Taneja, a much respected strategist from Ohio State University, offered an academic’s view on what he called “a new era of distribution”. Before Paul Coby summed up final speaker Antoine Rostworowski, Director, Business Development, Aéroports de Montréal, offered an enthralling insight of how airports might work for the future. Hopefully lost baggage will a thing of the past. SITA’s own development laboratory is working, in conjunction with Copenhagen Airport, on a method using mobile phone technology to monitor passengers passage through a terminal. At the gate the staff will know exactly where the missing traveller is, and data could be extracted to build up knowledge on the average time spent in duty free, food outlets and even the loo. 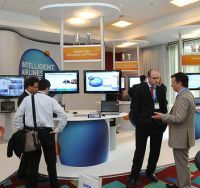 Day one was entitled ‘Industry Insight Sessions’ a detailed look at the whole IT business. Readers will find the detailed presentations on the website below and Airline Business will be carrying an in depth report in the August issue.